Galileo has finally been rescued from the private sector to be handled publically. Another month, it seems, another problem for the EU's Galileo satellite-navigation system - this time the 27 member countries have finally told the private companies involved in the GPS-busting scheme to pack up and leave . At a meeting in Luxembourg on Friday, EU transport ministers rapidly agreed the on the route previously speculated , whereby the eight private firms in the Galileo consortium would be sent on their way and the satellite network would become an entirely public project. 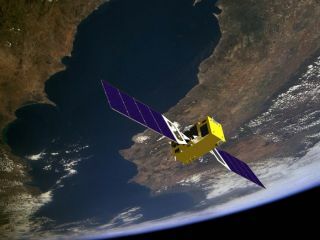 The reason for ending private involvement is considered mainly to be the inability of the companies to form a coherent management plan among themselves, but spiralling costs and doubts over the commercial viability of Galileo have also played a part. The £2.3 billion network of 30 satellites will now have to be paid for out of the public purse. German Transport Minister Wolfgang Tiefensee said "We want to try out all the possibilities of public-sector financing, including financing via the European Space Agency". As for the future of the project once labelled "stupid" by European Industry Commissioner Guenter Verheugen, a decision will be made in the autumn with an eye firmly on creating a commercial future for a navigation system that is, after all, intended to be considerably more advanced than its rivals.